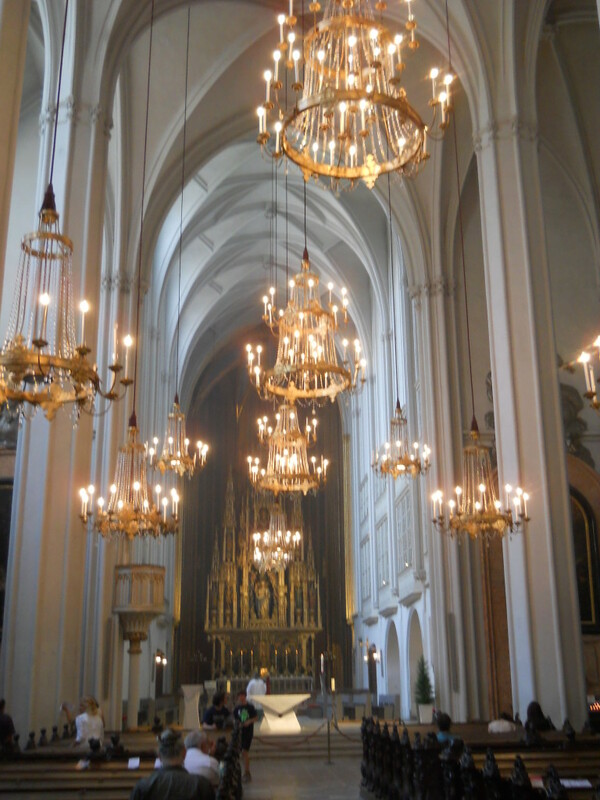 The Hapsburgs were christened, married and buried at St. Augustine in Vienna. This cathedral has seen a lot of pageantry and ceremony and the mass still reflects a polish and flair consistent with this history. I particularly noticed this in the treatment of the elements of the Eucharist. In all Catholic services, the host is treated with a great deal of respect. When congregants enter the door, they make the sign of the cross, and they genuflect before entering the pew. Both these actions are directed toward the host. After the Eucharist, the priest is careful that to gather and consume all possible remnants of the host. Water is swirled in each vessel and consumed so even the residue is collected. The plate and cup are then wiped with a cloth and this is folded and wrapped in an embroidered envelope and later taken to, what I imagine, is a ceremonial cleansing. This reverence for the host is seen in every Catholic service. In the mass at St. Augustine, all this was done with particular precision and flourish. This elaborate treatment of the Communion elements is easily explained. Catholics believe in transubstantiation, that is, the conversion of the communion elements into the body and blood of Christ. They are treated accordingly–even the last crumb. Because, in Protestant services, the elements are not seen as the actual body and blood of Christ, the sacrament has become less profound a ritual than is the Catholic Eucharist. In Protestant churches, Communion is a solemn event, but while I watched the celebration of the Eucharist at St. Augustine, I wondered if we could do more, especially in the language we use in our Communion services, to increase the significance and mystery of this sacrament. I’ve had Communion in a variety of Protestant churches across North America. On more than one occasion, I have heard the officiating pastor explain that the bread and wine are “just a symbol” of the body and blood of Christ. I do not contest that Communion is symbolic, but the use of the word “just” indicates that the speaker has fallen into a very limited understanding of both symbol and sacrament: a Modern understanding. The Modern mind is a rationalistic mind, and as such, it likes to establish clear categorical boundaries–nature/grace, faith/reason, spiritual/physical. To say that communion is “just a symbol” is to accept these modern dichotomies and suggests the physical elements in sacrament merely point to an intangible spiritual reality. The Christian ought to understand the limitations of this approach and see the fundamental unity in all of reality. The ultimate expression of this unity is the Incarnation; when the Word became flesh, “the eternal entered the temporal, but without ceasing to be eternal” (Zimmerman 265). God’s redemptive work in the death and resurrection of Jesus occurs in both the physical and the spiritual realm. The sacrament by which we remember this work is not simply a physical symbol, but also profound and literal spiritual event, for here, divine Grace intersects with nature, and the rational human agent partakes in faith and so is brought up to the divine. And through it all, God remains fully God. Does that sound a little confusing? It ought to be. While I watched the Eucharist at St. Augustine, I was impressed with the mystery and wonder of it all. I thought I could bring some of this wonder to my own participation of the Lord’s Supper. The Communion meal is symbolic but it is not “just a symbol.” And although we don’t believe that it changes into the body of Christ, the bread is far more than just bread. And should never be referred to as “gluten-free Rice Chex” (even if that’s exactly what it is). I have been working through this problem exactly. How can a symbol can be ‘sustaining’ or ‘life-giving’? Or how is it that when this symbol is taken Christ is manifest. If communion is only taken in memory of Christ or to proclaim his death until he comes, then what is going on in the partaker? Is he just thinking really hard about what Jesus did? Or is there, perhaps, something metaphysical taking place? “the eternal entered the temporal, but without ceasing to be eternal” (Zimmerman 265) — something like that; a ‘spiritual event’. If the Eucharist is ‘just a symbol’ then we need new categories concerning what sets this symbol apart from other symbols. Here, Catholic theology seems to over-understand the nature of Eucharist whereas Evangelicalism, whether they mean to or not, hoses much of the meaning out of it. I’m willing to except something in between the two.